Wow, June already...half the year is over, insane! Happy Bloom Day to all you out there, I hope you're having a good spring (or, at least, not a bad one). 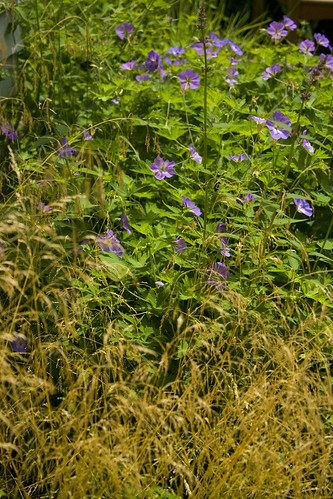 June is that month where the garden seems to explode with sudden growth, as the soil warms and the sun returns. Let's get going, shall we? 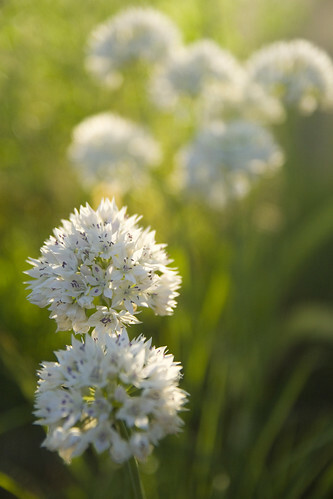 While most of the Alliums bloom earlier in the year, Allium cristophii is a late-bloomer, which is great, as it extends the season by over a month, plus, it's my personal fave of the ornamental onion crowd. 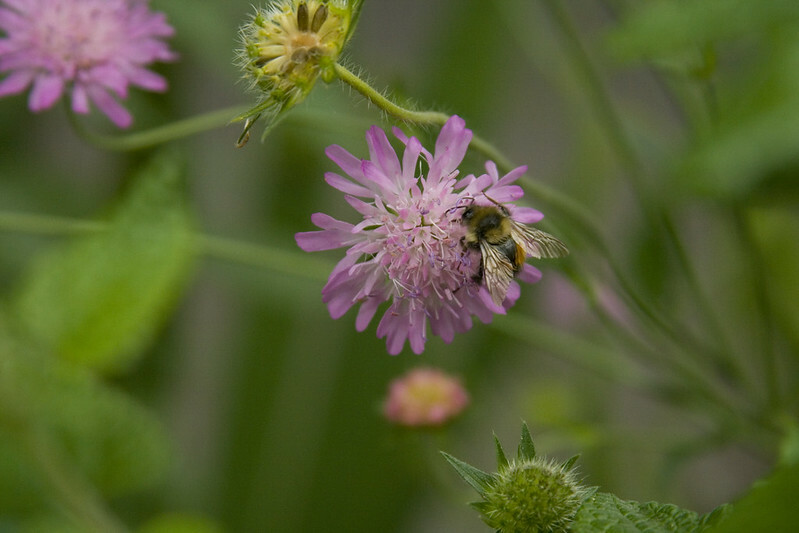 If you love bees, you should plant Knautia. Seriously, it's like bee crack. While the straight species is nice, I really like the hybrid 'Melton Pastels' as you get a nice mix of colors...perfect for adding variety while still having some cohesion to a border. ...and the typical deep red. If you want something shorter, however, and with more uniform red flowers, 'Mars Midget' is a good bet. 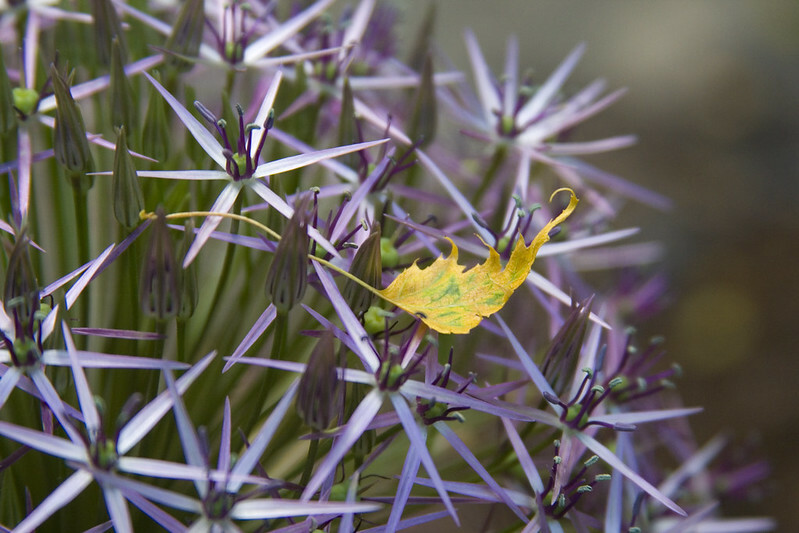 I just can't stop taking pictures of this Allium...so forgive me if I seem a little indulgent. A new (to me) Allium that I planted for the first time last fall, Allium 'Graceful'...and yes, it really lives up to its name. Sildacea oregana, on the right, rewarded my pulling it out of the garden last year for being too lanky and floppy, by reseeding itself everywhere. 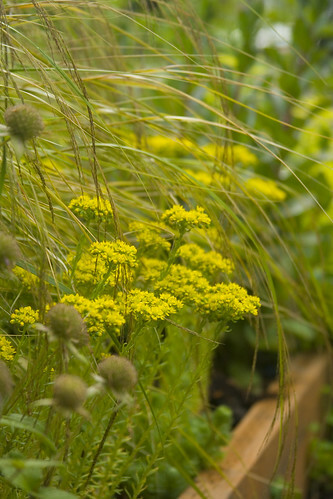 Happily, these smaller plants wind their way about quite pleasingly. 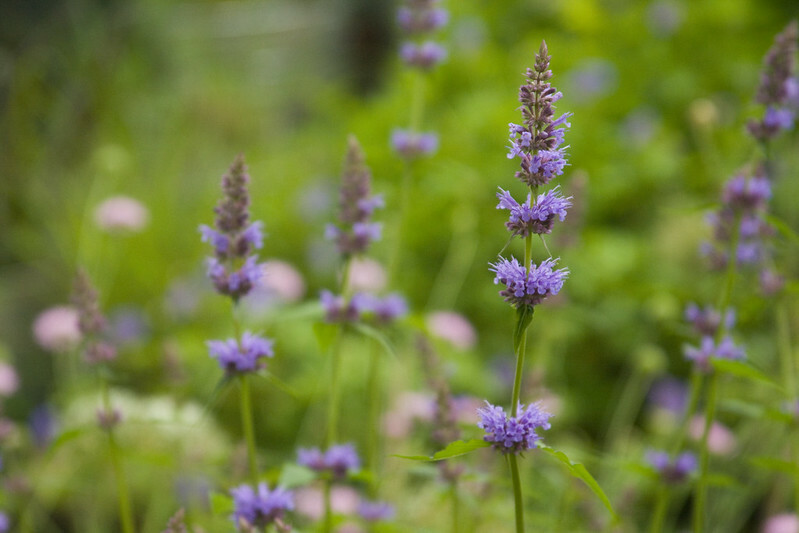 One of the standout plants from last year was this Agastache, 'Blue Boa'. It surprised me with its long blooms time and vigor. I love those rich purple blooms. My go-to Agastache for blue, 'Purple Haze'. 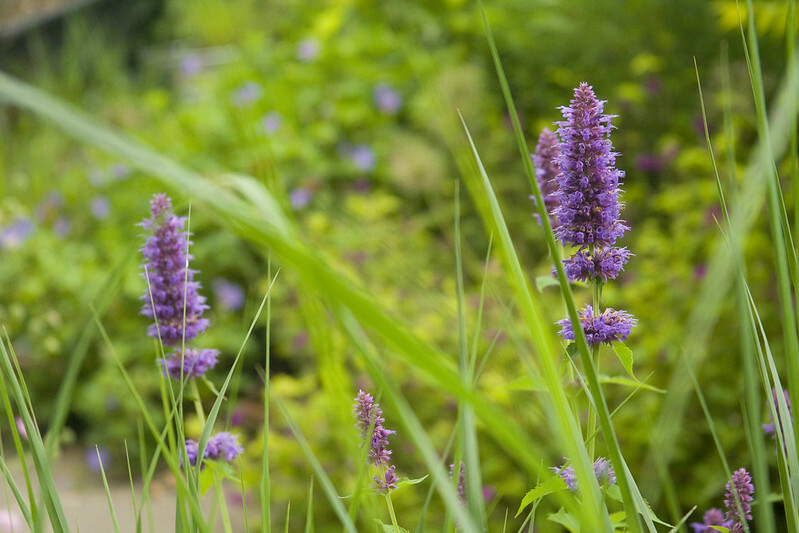 This Agastache is reliable and beautiful...if just a little more subtle than 'Blue Boa'. It wouldn't be spring on Rhone Street without some Astrantias, would it. Here, we have the large, chalky blooms of Astrantia maxima. And the silvery-pink blooms of 'Roma'. I realize, now, that I forgot to take pictures of the red Astrantias, 'Star of Beauty', 'Ruby Wedding' and 'Abbey Road'. 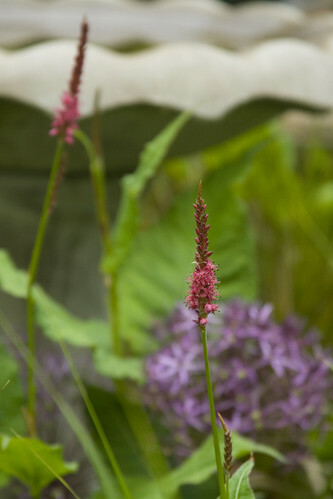 Rodgersia blooms can be surprisingly beautiful. 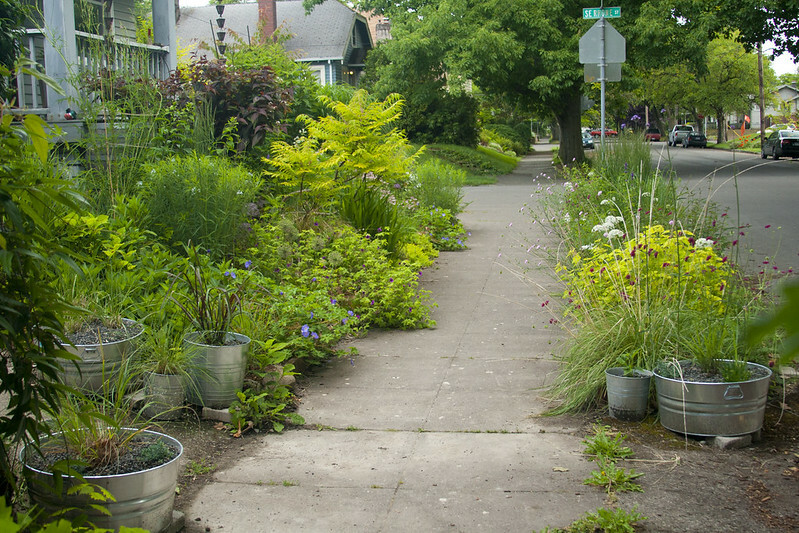 The Verbascum on the right is actually self-seeded from a plant on the other side of the sidewalk! Sorry, couldn't resist adding one more of the Allium. 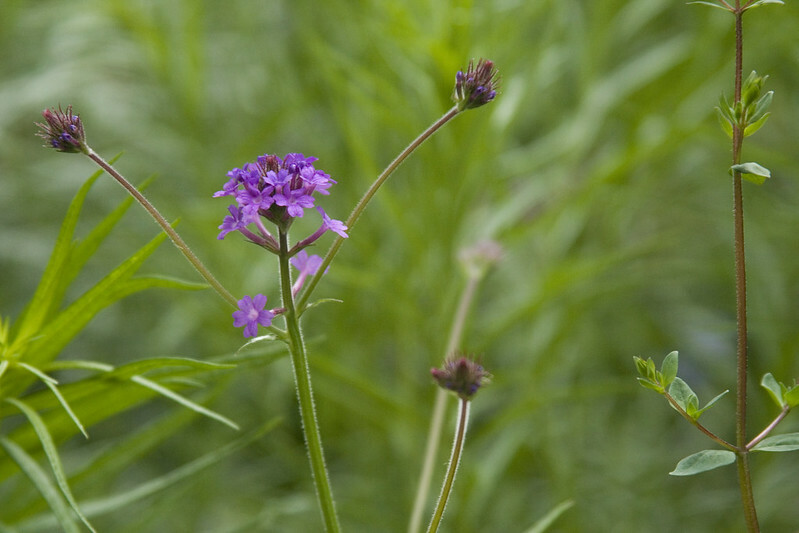 Verbena rigida tend to be a bit floppy in my garden (too much shade), but the electric purple blooms make up for any shortcomings. 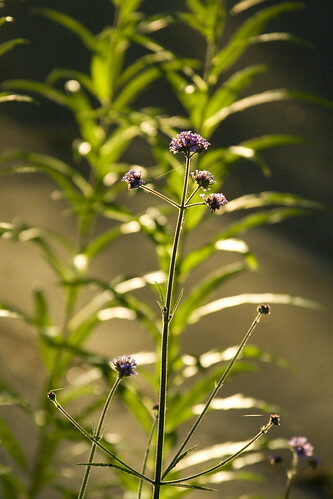 My favorite Verbena, however, is the tall, elegant Verbena bonariensis. Sedum 'Red Cauli', on the right has the best red color I've seen in any Sedum...sadly, it's just about the floppies, as well. 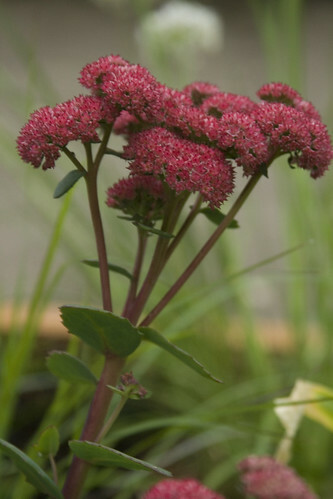 A sign of our weird weather this year, Sedum 'Matrona' is already blooming, several months earlier than usual. Has anyone else in Portland noticed this? A fabulous Salvia, 'Purple Rain'. I love the deepest purple blooms and the hairy stems...they are magical backlit. I can't seem to get enough little groundcover Sedums...and 'Oracle' is a beauty...the blooms...well, I guess they are interesting. All of the Persicarias are starting to bloom in my garden, the fist is the large, vigorous, 'Firetail'. 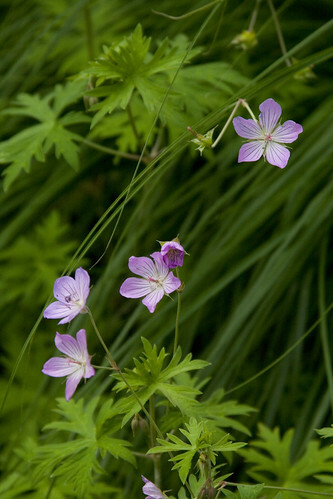 This hasn't been a great year for poor Geranium 'Ann Folkard'. Our lack of winter and weird spring have left her a bit lankier than usual, but she refuses to give up! Ryan Miller gave me the Geranium on the left, it's quite the spreader! 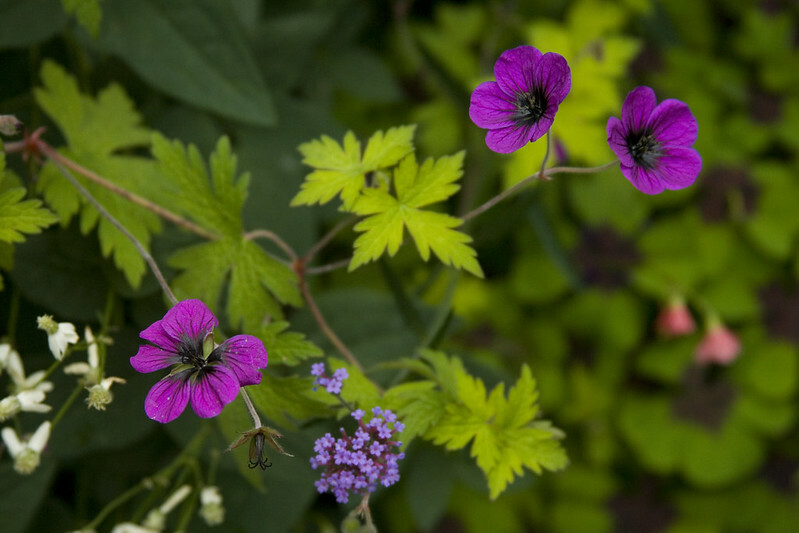 Of course, my favorite Geranium for it's beauty and vigor, is 'Rozanne', on the right. She looks good with absolutely everything! 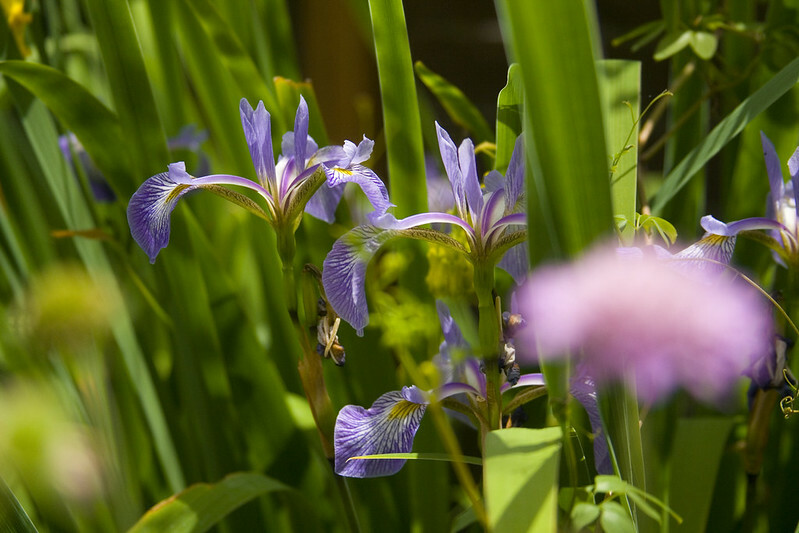 My Iris 'Gerald Darby' needs dividing badly, so I'm enjoying it's blooms for now, but will need to dig it up and split it apart after it's done blooming. 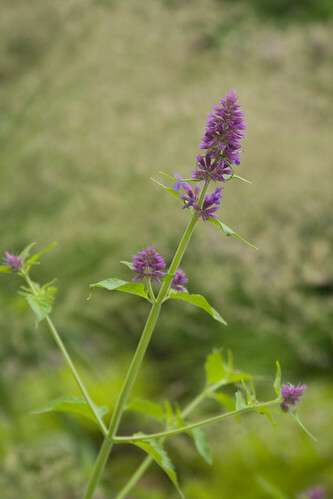 The giant of the Agastache world (well, at least in my garden), 'Blue Blazes'. I forgot to cut these back earlier, so I'll probably ahve 6' tall plants again! 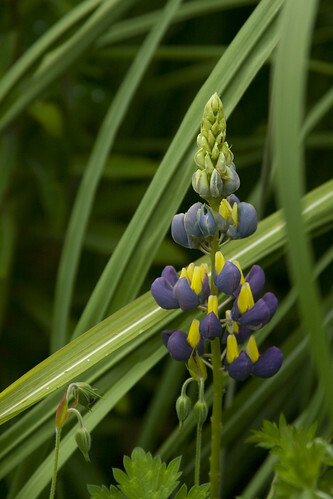 The little 'Thomas Church' Lupine I got from Annies a few months ago is blooming! I just hope it makes it through the summer...it's pretty puny. 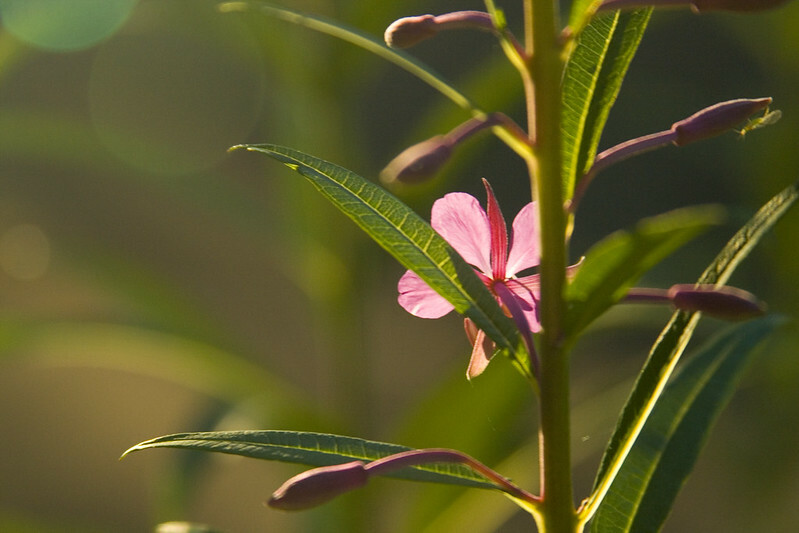 A PNW native, Epilobium angustifolium (Fireweed) is beautiful in bloom...but can get a little weedy afterward. I often cut them back completely after the bloom. Ok, it's not quite blooming yet, but those perfect spheres of Echinops bannaticus are so cool! 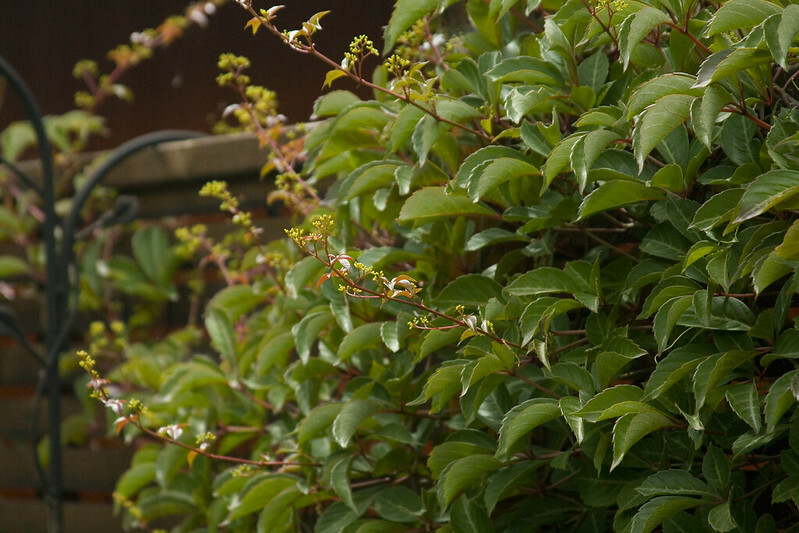 Even my Virginia Creeper Vine (Parthenocissus) is blooming...well, I think that's what it's doing! The crazy Asilboides has decided to bloom like crazy this year...the foliage mound tops out around 2' tall...but the blooms are taller than me! 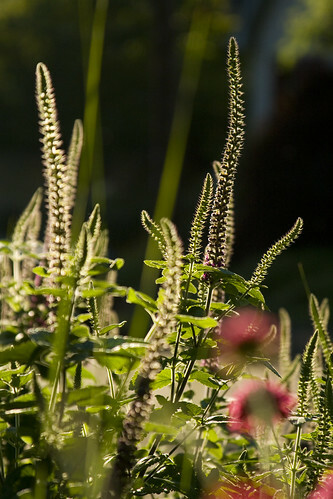 Teucrium is one of my favorite easy-to-grow perennials. 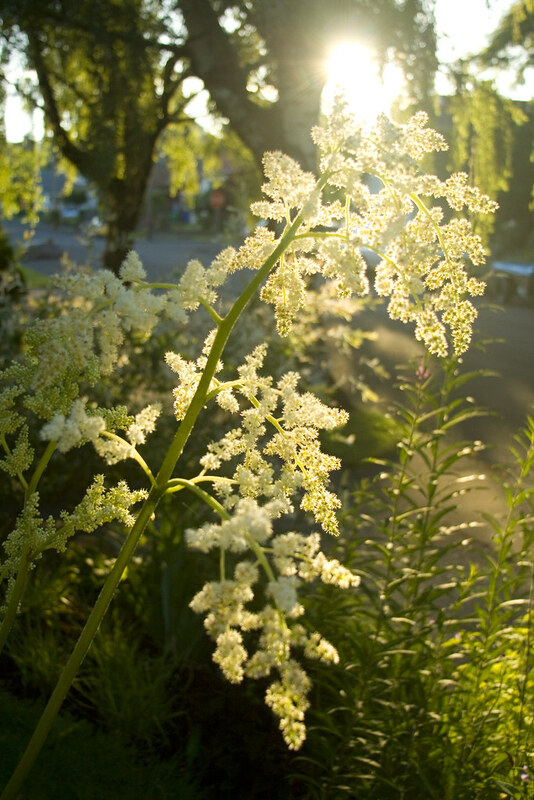 The blooms are gorgeous at any time...but when the plant is backlit...va-va-va-voom! So, to wrap things up, let's look at some wide shots. 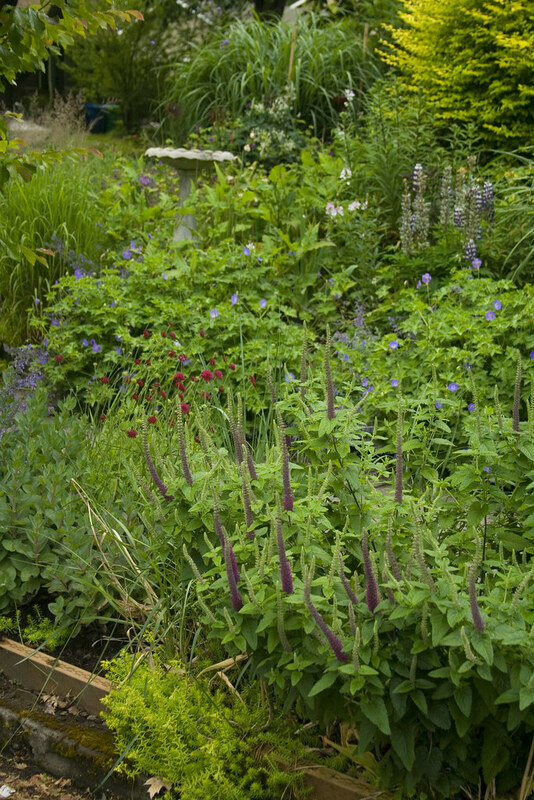 Here is the area with the Teucrium above, one of my favorite vignettes in the garden. 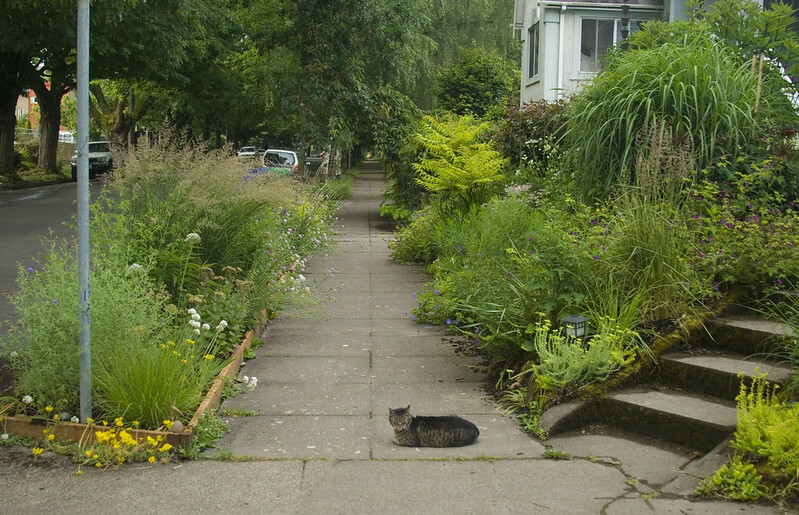 Here is the front garden from the south, showing my growing pot ghetto. And the same border, looking from the north. Here's the border that runs along the north side of the house. And my infamous grass path behind that border. Oops, I realize I forgot to mention the Sanguisorbia in the forground. 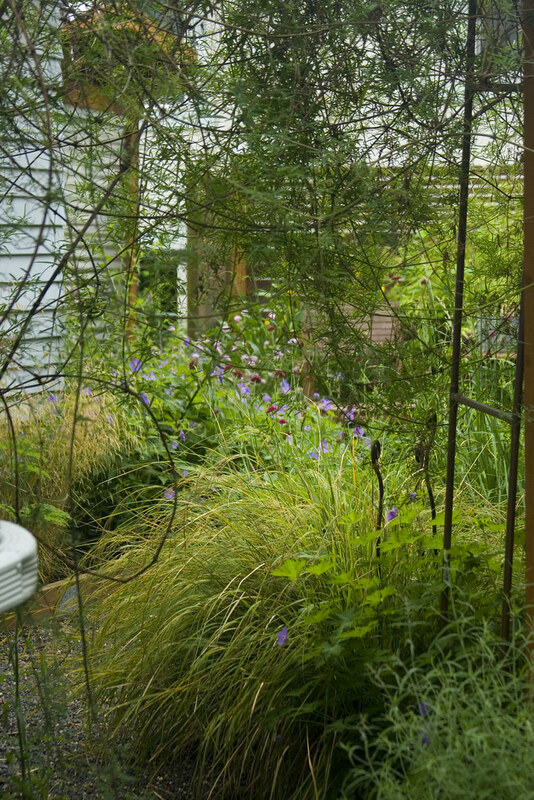 Here's the backyard seen through our copper arbor...yes, it's getting a bit jungly back there. That Clematis tibetana is a beast. And here's the backyard seen from our driveway. I hope you are having a great spring, and for more Bloom Day happenings around the world, hop over to visit Carol at May Dreams Garden. 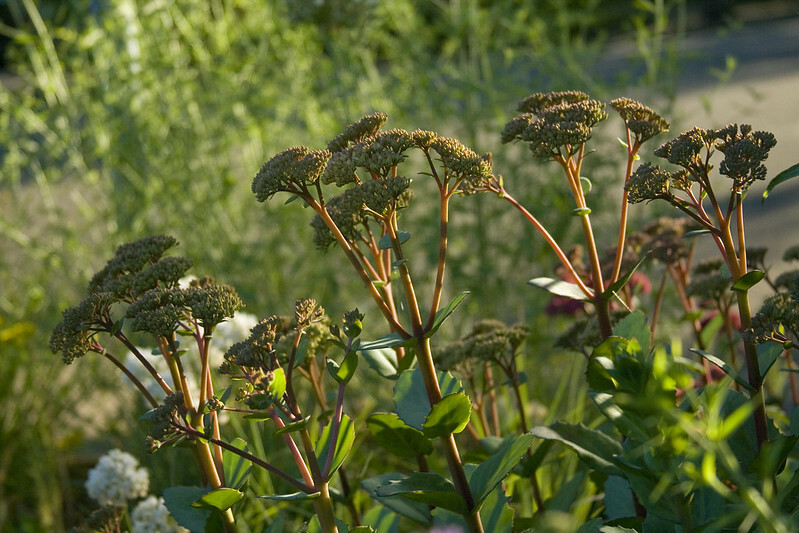 You should definitely try it, Spurge, it's a fabulous group of plants! 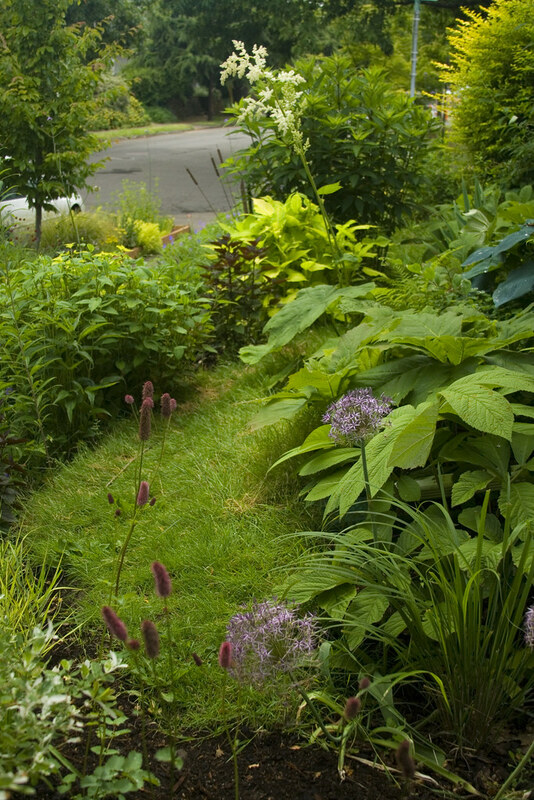 Nice to see how lush and full your garden is, of course it's also amazingly gorgeous too! Thought I had lost my Knautia, but thankfully it's popped up, if a little crowded. But I lost all my Scabious this year and know the Bees and Hoverflies will really miss them. Gorgeous photos, as always. And those astrantias are divine - I think I need some in my life. 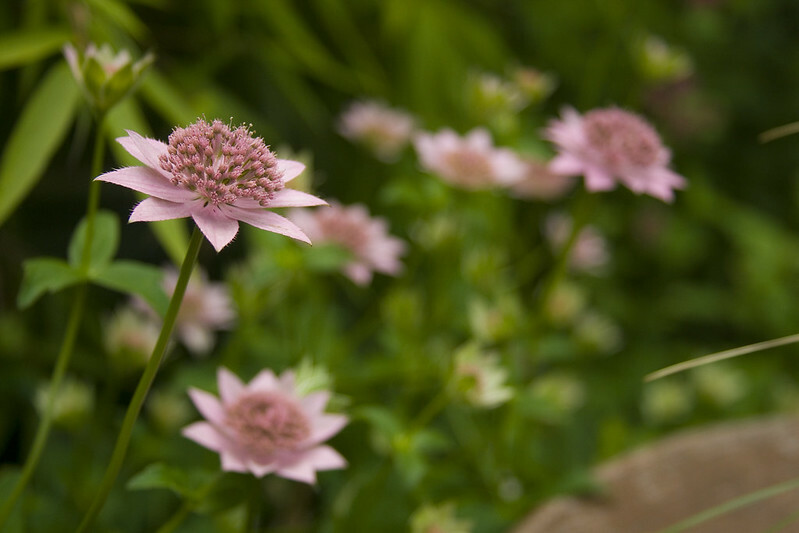 You would love those Astrantias in your garden, Kathyrn! I really like the backlit photos! I can see your garden has turned out beautifully for June. 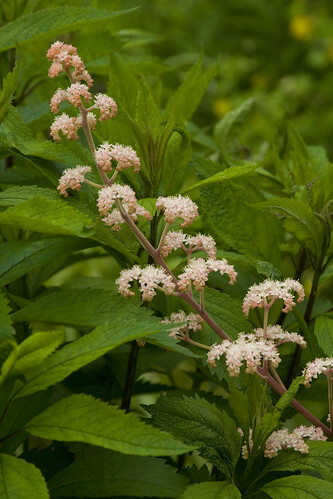 I love Agastaches, but in my garden I find I can't improve on the straight species A. foeniculum. I've never seen fireweed grown in a garden before. 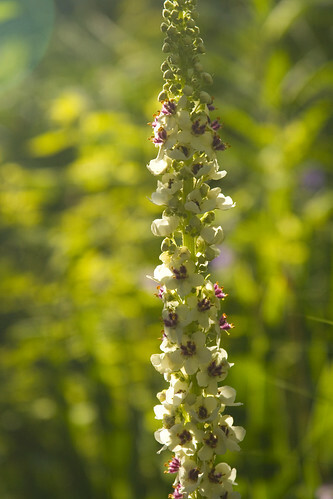 It is native to the upper midwest, also, but I've only seen it growing wild at the edge of the woods. I actually love the straight form of Agastasche, Jason, but for some reason, it has never done well in my garden (go figure). The Fireweed is probably better in the wild, to be honest, or, at least, a really large garden! So gorgeous! I have a variegated Knautia that I just planted this year, it has a couple of blooms, but I forgot to photograph it for Bloom Day. A few always seem to get left out. I really enjoyed the wide shots. Your pot ghetto looks great, in galvanized tubs. Loved seeing the kitties too, my favorite garden helpers. Oh yes, Alison, I remember seeing you post about that Knautia last year...how has it performed, would you say??? Scott those photos simply glow...stunners all. And I love the kitties...they have the right attitude. I also love the way the gardens are coming along. My back gardens are getting like a jungle with all our rain. The Allium cristophii is becoming my favorite to spot in other people's gardens. And I left Echinops ritro behind in my last garden and you're making me wish I still had some Echinops - any Echinops. Discerning kitties know where to hang out: June in your garden is looking wonderful, Scott! So weird that Matrona and P. amplexicaule are blooming for you already. 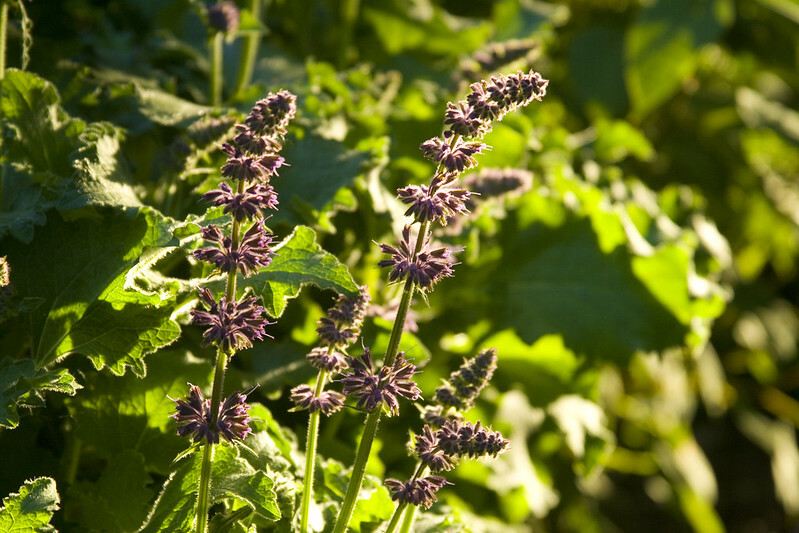 The only agastache I'm growing this summer is 'Blue Fortune,' just bought local in the past couple weeks, so I'm taking notes from you. 'Blue Boa,' you say is the name to remember...or I might just stick with that teucrium. Isn't it something? Beautifully lit photos, and I love the color combinations you use. 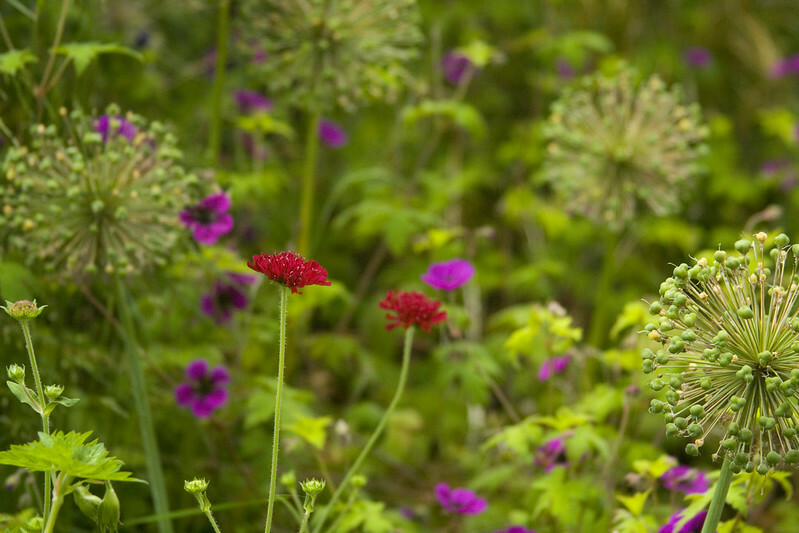 Knautia and Allium cristophii are going on my wish list. Perfect back garden for a cat nap. Wow...wow and more wow! Your gardens and photography are beautiful. The Allium is deserving of multiple shots! I enjoyed the visit. Fantastic bloom day Scott! For once, a plant you grow that doesn't well in my garden, Astrantia. I love them too. Just planted Moulin Rouge this year. 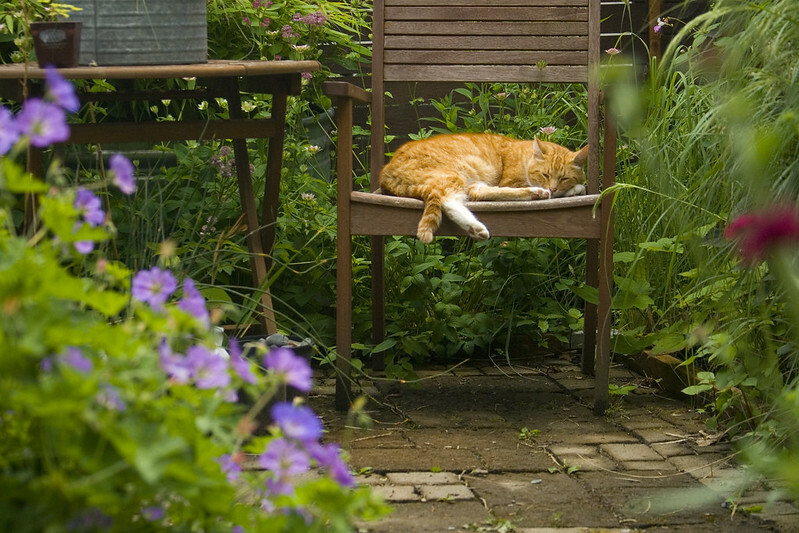 I could quite happily join your cat for a wee sit down and dream the day away listening to all those buzzing bees! OMG...I've been wanting to see 'Moulin Rouge' in person...it looks AMAZING in photos! Look fabulous Scott , and great photos as always. I see that you are signed up for Saxons class on Fling Saturday am...see you there ! As always, I am amazed by what you are able to cram into your city lot. And the back lighting - did you take some of these photos at sunset? They do glow. Sometimes the light is just right and the effect is spectacular. Beautiful blooms and beautiful photos! I covet the Astrantias - they're up there just below herbaceous peonies on the list of plants I wish I could grow but, alas, they don't seem to like SoCal. Ah yes...there is always something we have to covet, isn't there, Kris! Then again, there are things you can grow that I wouldn't have a hope of growing! Scott - you are lethal with that camera! Such fantastic photos! I might have to get some of those Knautias. I'm all for helping the bees out (dad's a bee keeper) - especially when the object of their affection is pretty! 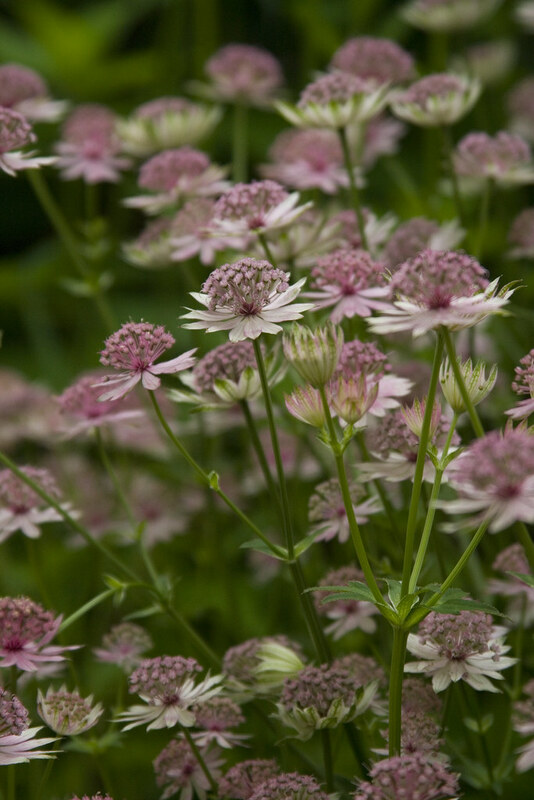 Astrantias too, are on my wishlist - they are so lovely! 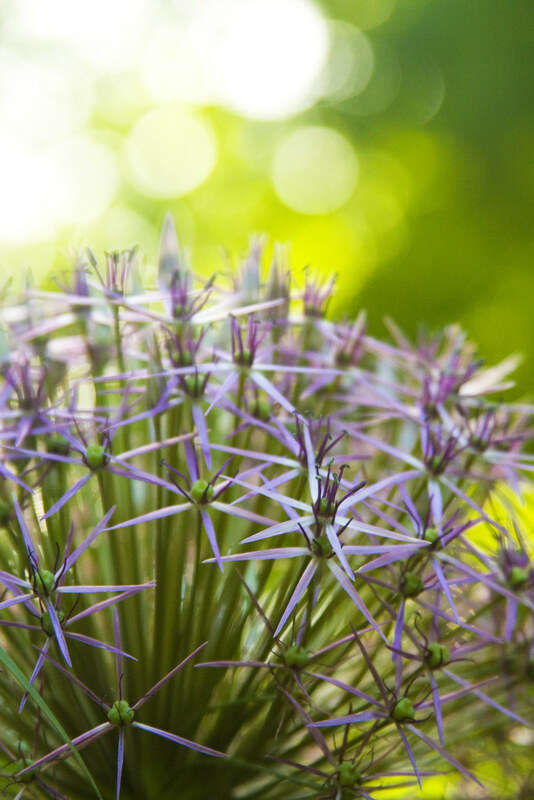 Also, for the record - your photos of alliums will never be lost on me. And, when you do divide that Gerald Darby - I'll happily trade you something from my garden for a start of that - take your pick! It never ceases to amaze the selection of plants you have, and your dreamy photography! 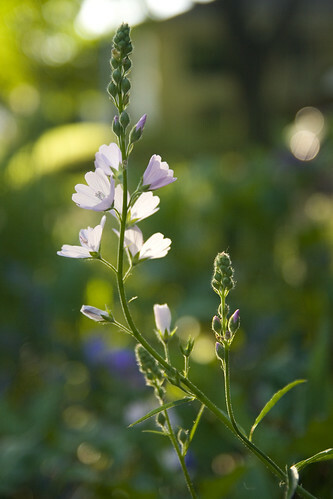 Your garden abounds blooms right now and so many lovely choices to choose from for a favorite. Everything really looks great right now. Love the cat. Thanks, Cher...June is such a fabulous time of year, isn't it?! Yes...you definitely need some Echinops...it's such a great border plant! I know...the poor Sanguisorbias! I love them all, even the tall one I have in front that flops everywhere! 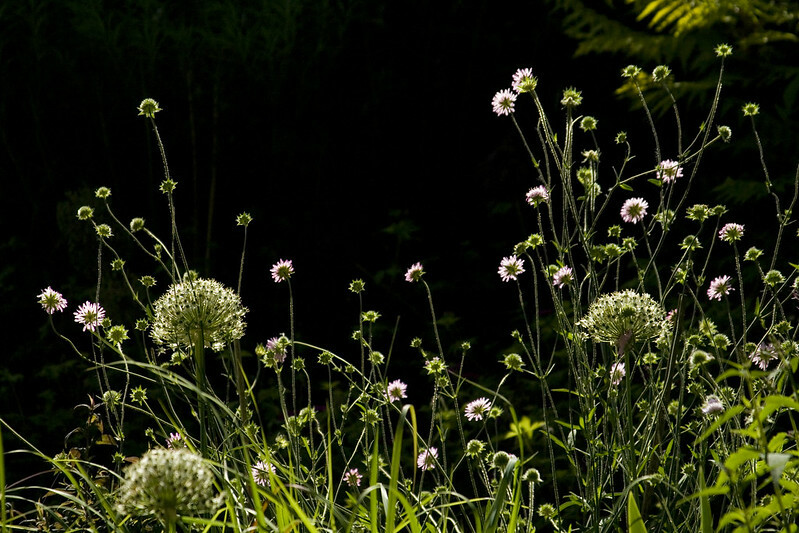 Every time I see your photos of knautia, especially the backlit shimmering ones, I know I must add some to my garden. (I think I said that last year about Mars Midget, so I really do need to act on it). It's bee crack for the pollinators, but I think I'd be addicted to it too. Just breathtaking. 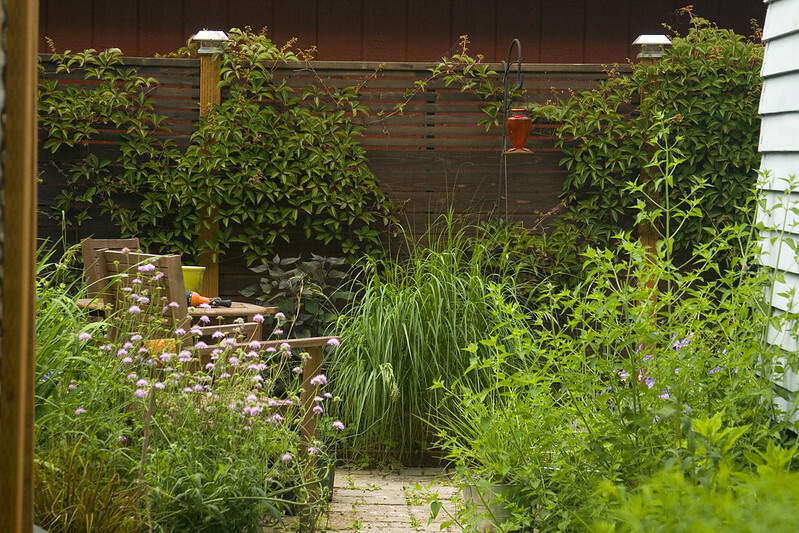 All your photos are beautifully shot, and the garden is looking so good. 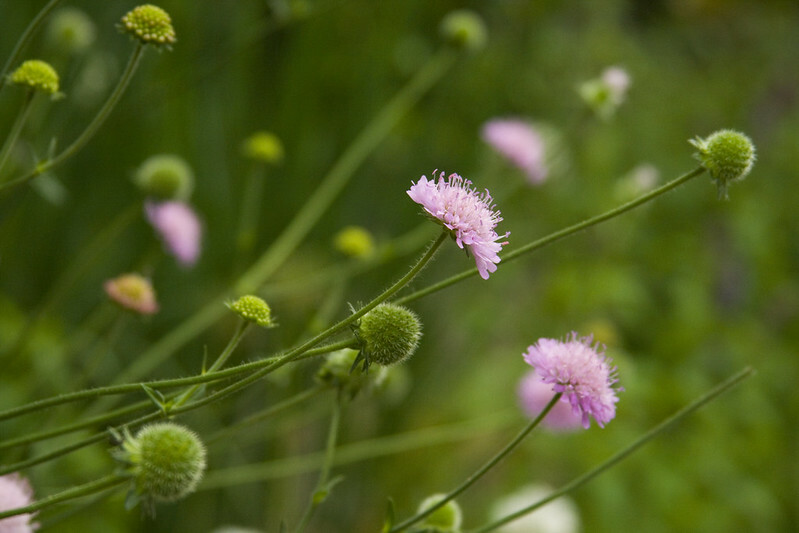 Oh, Laurrie, Knautia would look smashing in your garden...if you try the taller ones, give them a neighbor who can lend a little support...those tall, wiry stems can get a bit top-heavy! Such an abundance of bloom in your garden and gorgeous pictures! I love Allium Christophii as well and had it in a container last year but it didn't survive the winter we had, so none to enjoy this year. 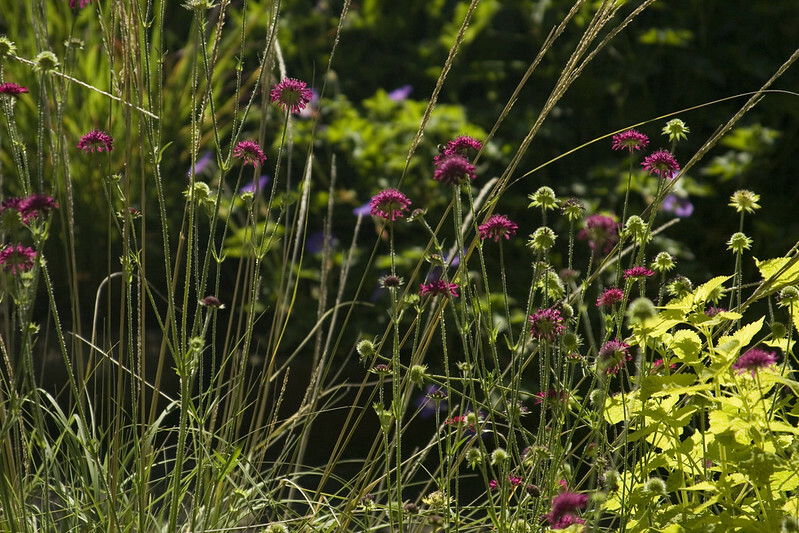 I love Knautia as well but it loves sun and won't do well in our garden. It's one of the many flowers I've once sown in pots years ago. I should do that again. I'll keep it in mind for next year. Glad to have found your blog. A post of just allium would be A-okay with me. I think we need to go astrantia shopping! We totally need to do that...I'm game any time you are! You've reminded me about Echinops, I don't have one in my current garden and should. Another much loved by bees if I remember rightly. OMG...bees LOVE Echinops...they fight over those blooms! That is the one Echinops in my garden that gets quite a bit of sun, the rest are in a shadier location, and quite a bit behind that one. I love allium Chris., too. Unfortunately it is not a reliable returner for me...and if it does come back, it is at least 50% smaller each year. Your garden looks fabulous, Scott! It looks like spring was kind to Oregon this year. Wow! 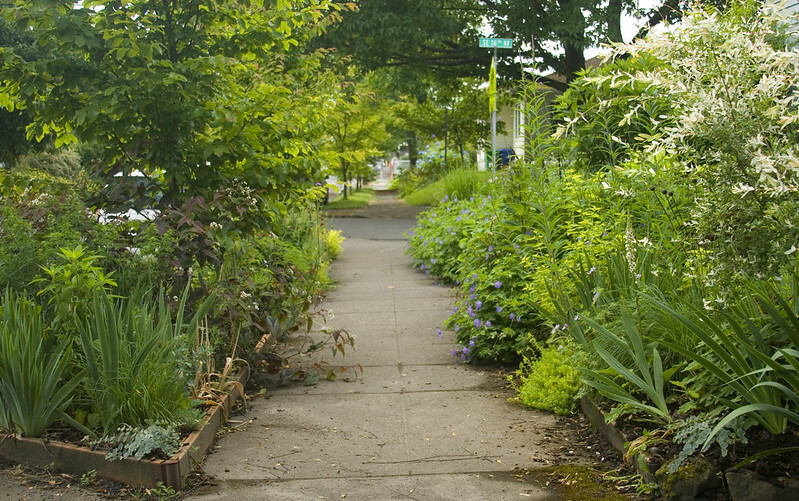 Where do I start with what I love about your garden? So many great plants. I planted teucrium this spring and am waiting for it to bloom. Your display now has me very excited. 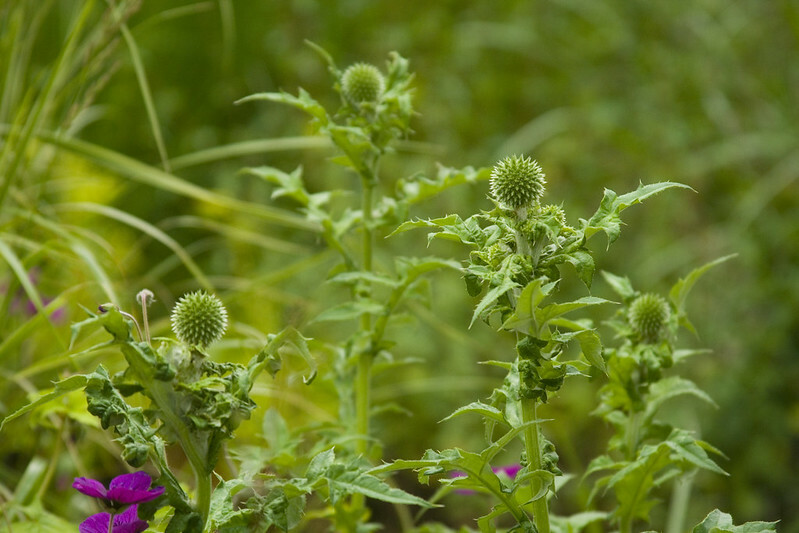 Since you love echinops, if you have space, take a look at rattlesnake master Eryngium yuccifolium. It takes about three years to be glorious. I had to give up on echinops. Despite what the resources say, the deer ate mine. I'll have to keep coming back to this post. So lovely! I planted my 2 Knautia 'Melton's' next to each other and they are so tall they kind of invade each other, but I like yours planted alone where it can really spread out over your whole parking strip. Your parking strips have really taken off, so tall. I also have the variegated Knautia but it is behind the other 2 and just starting to bloom. I'll have to try to save some seed and see if it will come true. Your garden is an inspiration as usual, lovely! Beautiful photos and plants as ever! 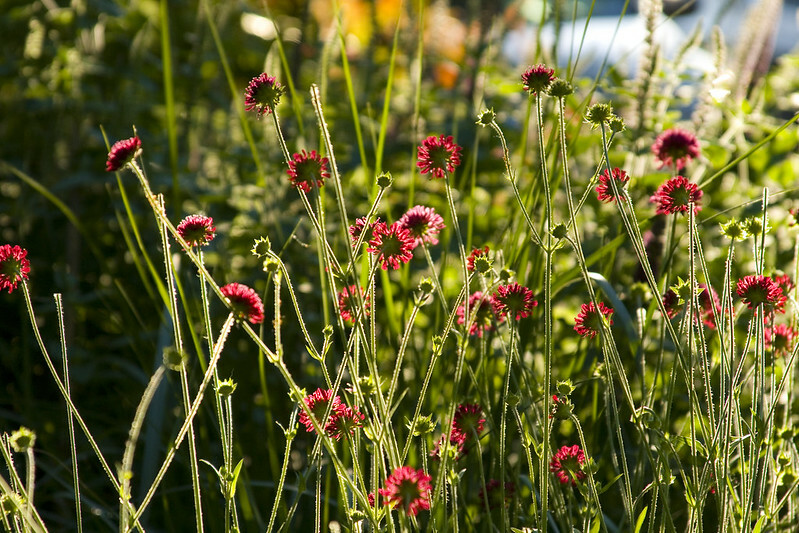 I particularly love those sun-kissed knautia against the dark background. We finally lost ours this year after non-stop blooming for a couple of years, still have a small variegated one but will have to replace the species one, its crimson buttons are so alluring. There aren't enough words. Beautiful! I shouldn't visit here because my plant wishlist just gets longer and longer. Magnifiques photos, le tout est superbe pour une amoureuse des jardins. 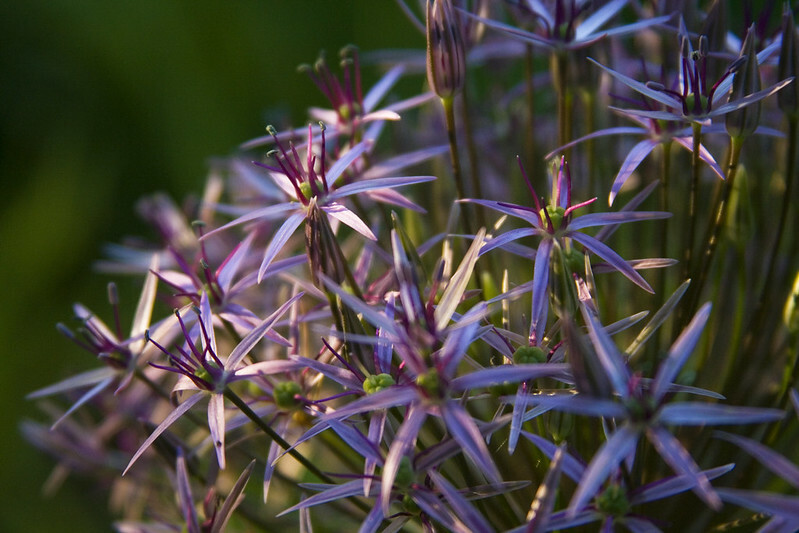 Fabulous photos - I really loved your Allium shots - you could have taken more of them as far as I'm concerned! Lovely Astrantia too. I have noticed that the Geraniums here are lankier than usual. Perhaps they will bulk up when we give them a haircut after the first flush of flowers. It's been a nice long spring here in the northeast. We had a couple spells of very hot weather, and above average rainfall, but overall, the temperatures have been quite moderate and the spring bloomers have lasted a good long time! I need to start reading your blog with a notepad beside me, so I can make a list of all of the things I would like to try in my own garden. Your Knautia always catches my eye, as well as the agastache and astrantias. 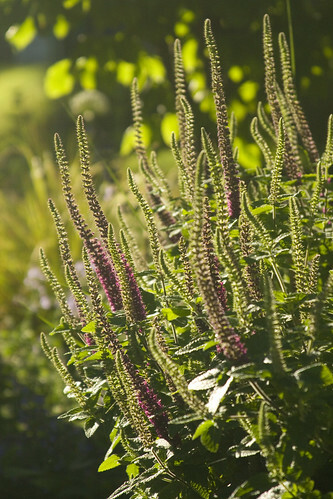 That teucrium is an eye-catcher as well! My May Night Salvia is like crack for the bumblebees around these parts! It's always a pleasure to read your Bloom Day posts! If all of your A. christophii photos turn out that well, you have my permission to take even more. Stunning garden, love all your flowers a. Thanks for the proper names on some of them.i will be back to visit again. My new favorite allium, new for me this year. It is great looking, saw it at Northwind Perennial Farm last year. Your garden looks fabulous this year, so lush. I'm finding so many of my garden plants, past and present, and so many I would like to see in my future! Lovely work Scott!